Mazda teased a crossover that will be unveiled in Geneva. CHICAGO — Mazda has just three crossovers on sale in the U.S. market, but that's going to change, vows Masahiro Moro, CEO of Mazda North American Operations. The brand now has two new crossover models in the pipeline, Moro told reporters last week at the Chicago Auto Show. One is the as-yet unidentified vehicle that will be produced at a U.S. assembly plant that has begun construction in Huntsville, Ala. The other is a crossover that Mazda will unveil next month at the Geneva auto show. 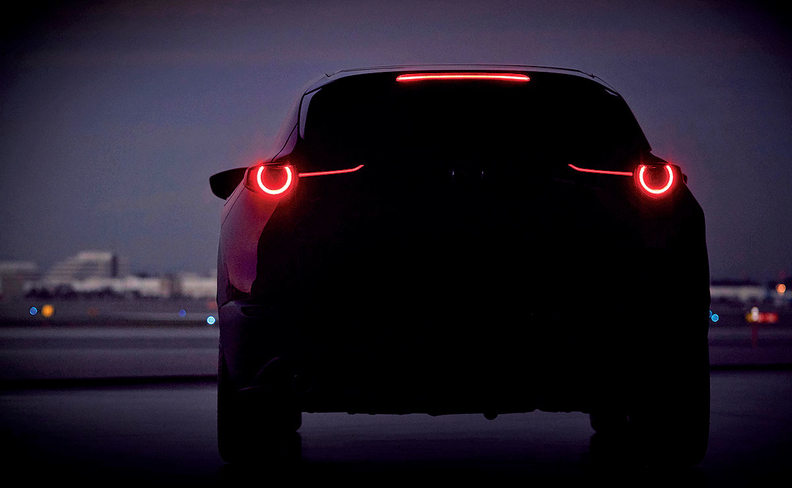 Last week, Mazda released a teaser image of the crossover that will be shown at next month's Geneva auto show. Moro confirmed that it will be sold in the U.S. but said that Mazda has not determined when. He emphasized that it will be a different product from the crossover planned for production in Alabama, although the two vehicles will share some architecture. The company has remained mum on the identity of the Alabama-built product. Moro said only that it will be "a new crossover SUV which is exclusively designed for the North American market." He said Mazda is finalizing the concept of that vehicle. Mazda's U.S. crossover lineup consists of the subcompact CX-3, compact CX-5 and large CX-9. For the small Japanese brand, two crossover additions could have a significant impact on U.S. sales. In 2018, Mazda sold 150,622 CX-5s in the U.S., which accounted for of the brand's total of 300,325 sales. Moro also confirmed that the of the CX-5 is not dead but declined to specify when the vehicle will go on sale in the U.S. outside of the "near future." Mazda is working with the EPA to obtain certification for it, he said. "I hope diesel loyal customers are looking forward to it," he said. Vehicle production at the Alabama plant is expected to begin is the middle of 2021, Moro said. The plant will add 150,000 units of crossovers to Mazda's capacity.